There are few artistes who qualify to be called a living legend. 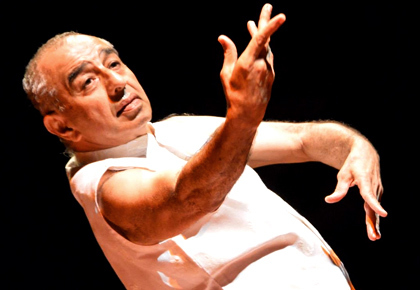 India's finest contemporary dancer, Astad Deboo, is one of those rare few. On Sunday, the Sri Krishna Gana Sabha, one of Chennai's foremost cultural organisations, will step beyond its support for traditional dance forms to honour Deboo with the Yagnaraman Living Legend Award. The attention-seeking warning horn sounded loudly from the loaded cargo ship, itching to leave its moors in Bombay for the port of Khorramshahr, Iran. Its human passengers -- mostly labourers going to the Middle East in search of a job -- were already on board, prepared to spend the next many days in a cheap, dormitory-like room, packed with bunk beds, breathing in stale air, with none of the luxuries available to the cruise ship revellers of today. Emotions were roiling inside the 21 year old elegantly structured, straight-backed young man, whose eyes were focused the familiar coastline. With just $300 in his pocket, he had finally made his decision, inspired by a performance he had watched by the American Murray Louis Dance Company. He would dance; it would be his life. That decision marked the birth of India's finest contemporary dancer, Astad Deboo. Astad didn't know it then, but he would not return to India for the next few years. Instead, in the next two-and-a-half-months, he walked, hitchhiked and sometimes took the boat through Teheran, Turkey, Greece, Italy, Switzerland, Austria, Germany, Belgium, France to reach England, his final, destination, by taking the ferry from Calais to Dover. Now, in London, he waited for his American visa -- Astad wanted to study at the Martha Graham School (Graham was one of the world's greatest contemporary dancers and choreographers) -- and studied for three months at the London School Of Contemporary Dance. In typical Indian jugaad style, he taught Kathak -- a dance form he had studied for 10 years before he was made to discontinue because "Parsi boys don't dance" -- and used the money he earned to play for his dance classes. But when the wait for his American visa stretched eight months, with no end in sight, Astad made his way to Canada instead. He learnt, taught and danced his way -- mostly at universities, international programmes and occasional television shows, to fund his travel and education -- across Europe before moving to the Asian continent. Astad returned to Mumbai for his eldest sister's wedding in 1972 -- he combined it with a three-month study of Kathakali's Thodayam and Purapaddu -- but would not return to these shores again until 1977. By then, his dance had evolved even more, but opportunity in India was scarce. In 1978, two legends -- Jennifer Kendall Kapoor and Satyadev Dubey -- agreed to give the 31-year-old dancer an opportunity to showcase his art. For six years, after his return in 1977, he studied Kathakali under Guru E Krishna Panikar and, in what the dance exponent confesses is a proud moment, performed at Kerala's famed Guruvayur temple. Impressed by his Kathakali performance, the renowned Pina Bausch asked Astad to join her Wuppertal Dance Company in Germany. Internationally, too, his creativity began to be recognised. Master designer Pierre Cardin, known for his love for the avant garde, saw a kindred spirit in Astad and invited him to choreograph for the incredible Bolshoi ballet dancer Maya Plisetskaya (Don Quixote, Swan Lake and The Dying Swan). It would become, more reasons than one, an experience Astad would never forget. More than ten years had passed since he returned to India. While international recognition came his way, the gurus of Indian classical dance were yet to accept Astad and would not allow their students to perform with him. It was at around this time, in 1988, that theatre personality Zarin Chaudhury invited him to work with the Action Players, a group of aurally challenged performers based in Kolkata. Over the years, he has also worked with Chennai's Clarke School For The Deaf. He has inspired the youth being helped by New Delhi's Salaam Baalak Trust. He has worked with the Thang-ta martial dancers and Pung Cholom dancers of Manipur, bringing their art to the world stage. When it decided to honour Astad Deboo in 1997, the Sangeet Natak Akademi had to create a new category; they called it Creative Dance. It was a fitting answer to all those who had doubted Astad, to those who would dismissed what he had created, to that Delhi bureaucrat who told him that his talent only would be recognised after his death. In 2007, he was honoured with the Padma Shri. But the award he will receive this Sunday in Chennai, the Yagnaraman Living Legend Award, from the Sri Krishna Gana Sabha, one of Chennai's foremost cultural organisations, holds a very different meaning for Astad. It is recognition from a bastion for the pure classical forms of dance and song, from the gurus who would not accept him and his dance form for the longest time. Last year, Astad was invited to Buckingham Palace to meet Queen Elizabeth, her grandson William and granddaughter-in-law Kate as part of the delegation to launch the India-UK Year Of Culture. "The most spectacular part of the evening was being presented to the Queen," he recalled to Rediff.com, "The member of the staff standing next to her whispered in her ear that I was a dancer and she said, 'You are a dancer? I hear you are a pioneer'." "Then she sort of started showing little hand gestures -- and said, 'See this is how I move'." But more excitement awaited Astad back home. 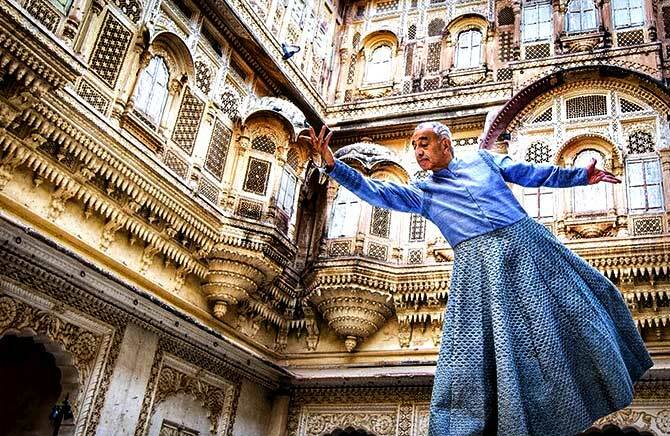 Brushing shoulders with royalty, globe-trotting -- Astad has visited 75 countries and danced in 70 -- and hobnobbing with celebs across the world might seem glamorous, but Astad has a few words of advice for the starry-eyed. He has always had to struggle for finance for his shows -- both his own and the shows he has created for the aurally challenged performers he has trained. Today, at 70, after so many decades of celebrated work behind him, he continues to struggle. "Don't look at my life as a life of glamour," he issues a gentle warning. "There is a lot of hard work. You have to study. You have to develop your own vocabulary of dance. And you have to keep at it, because you never know when the 'no' might become a 'yes'." When Astad Deboo made a fort dance!